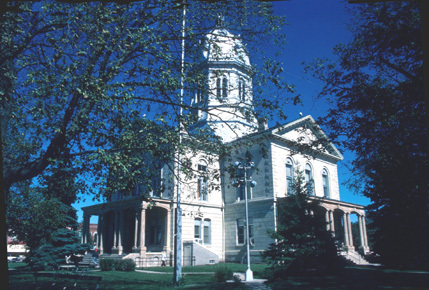 The descriptions of Madison County courthouses are taken from the History and Business Directory of Madison County, Iowa, published in 1869, and from various other county history resources. After laying out the town of Winterset, one of the first tasks of the county board was to construct a place where justice could be administered. The court house was built of logs on property that is now known as Monumental Park. The cost of the building was $150. Being one of the first public buildings in the county (the others being churches), it was a multi-use facility, being used as a courthouse, church, school house, hotel and tavern. During the very early years, a continuous stream of covered wagons traveled through Winterset on their way west and the only place to stay the night in bad weather was the courthouse floor. 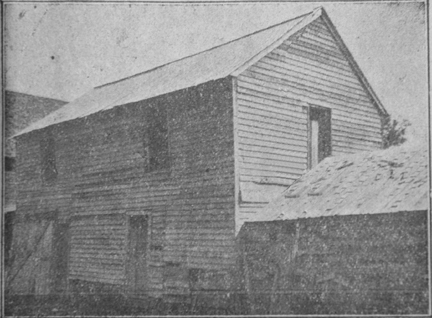 The original courthouse, shown in the above photo, was eventually covered with siding and moved from its Monumental park location. The photo is circa late 1890s. As the county grew and prospered, the log courthouse became inadequate. Madison County commenced the erection of a magnificent Court House building in the Spring of 1868. At the time of writing (1869), the foundations have been laid, and the walls finished above the water tables. It is expected to be finished within three years from the time it was first commenced. When completed, it will be the finest Court-House building in the State. (Editor's note - It appears from comments found in the Madisonian that the new courthouse was occupied sometime in the first half of 1871). The description of the building is as follows: The form of the building will be a Greek Cross, each arm of the Cross presenting a front, and each front exactly alike. Over each front will be a fine piazza, with stone columns for its support. This will stand eight feet above the natural level of the ground, and four flights of stone steps, fifty feet wide will lead to it, supported on either side by stone balustrades. The dimensions of the building, not including the piazzas, will be from end to end of opposite arms of the cross one hundred feet, and the width of each arm will be fifty feet. The basement will extend, as we have said, eight feet above the level of the ground, and will be graded up three feet. That above ground will be cut stone. This basement will be floored with concrete and brick, and will be used for storing fuel and other purposes. The first story will be some twelve or fifteen feet in height and will contain the rooms for the county officers, and one room for city purposes. It will also have four fire-proof vaults. The external will be built of stone, cut in rustic, like the Bank front. The second story will be about twenty-two feet high and will contain the Court-Room, Judge’s and Attorney’s Rooms, Grand Jury Room, and several Petit-Jury Rooms. The Court-Room will be forty-five feet by fifty-four feet, and will open into a large corridor. The ventilating arrangements are ample and perfect. The outside face of this story will be of dressed stone. The arms of the Cross not used by the Court-Room, are to be divided by a floor, giving in three of the arms a third story. Two of these will be left unfinished; in the other will be the jail, which is a room about twenty-three by forty-six feet. It will be entirely lined-floor sides, ceiling—with boiler-plate Iron. Inside this room there are to be eight Iron cells, with all modern Improvements. This makes our jail above the reach of outsiders and entirely safe, giving at the same time good ventilation and avoiding dampness. The whole is to be surmounted with a grand dome, made of wood but covered with metal. In the dome is to be placed by the contractor a 1500 pound bell and a large clock with four faces. From the center of the clock to the ground will be just ninety-nine feet. The top of the spire will reach 163 feet from the ground. The dome Is to be a 40 foot wide octagon, and on four sides will be open blinds and on the other four sides glass doors. A flight of good wide stairs leads to this part of the dome which will be floored and given a room over thirty feet in diameter. When completed, with wide blinds to all windows and in all respects ready for use, it will cost about $75,000. In the fall of 1871, after the courthouse had been completed and occupied (final cost was $106,000...things never change, do they...), there was considerable antagonism between the board of supervisors and the citizens regarding the use of the courtroom. The board of supervisors designated it to be used for judicial proceedings only whereas the citizens wanted to use it as a general use room for meetings, concerts, and other gatherings. By the end of 1871, the board of supervisor's position was still being enforced. Another issue with the new courthouse was that the chimneys had been built too small and weren't providing sufficient draft. A workaround for this problem was in place by the end of the year. Perhaps this workaround contributed to the courthouse's premature destruction. The second courthouse had a useful life of about 4 years before being totally destroyed by fire in 1875. It was not insured and so the county citizens lost $106,000, a princely sum for that era. As soon as the ashes cooled, plans were started for a yet a third courthouse, very similar in design to the second one. 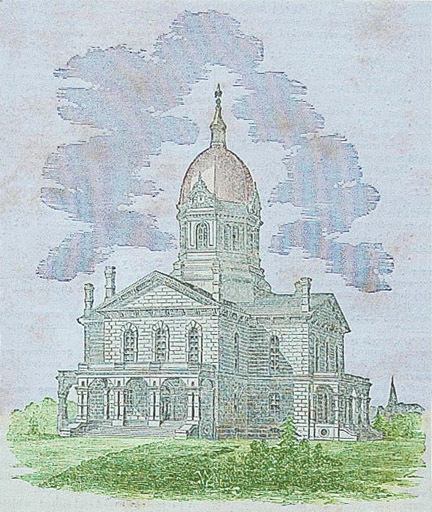 Construction started as soon as the plans were drawn up and the new courthouse was completed and the building occupied in 1878 at a cost of $130,000. It still serves today as the county courthouse and is listed on the National Register of Historic Places. 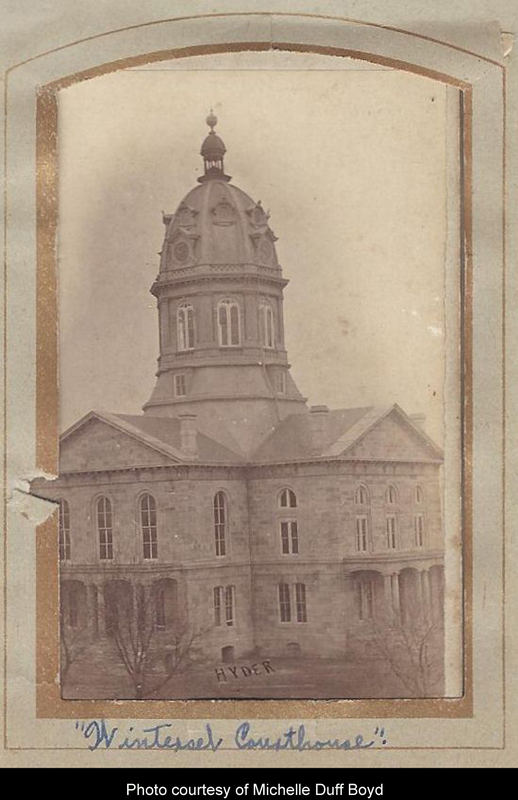 A very early photo of this courthouse by Winterset photographer Ed Hyder can be seen here. This page was created on April 03, 2004. This page was last updated Thursday, 19-Jan-2017 21:37:20 EST .